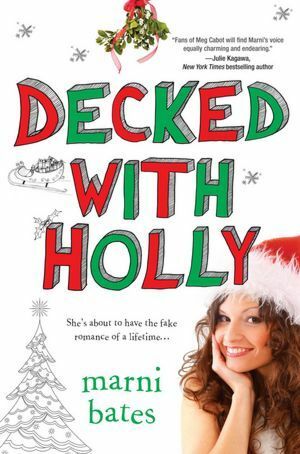 Decked with Holly is another cute read from Marni Bates. In this novel, we've got Holly Dayton, a 17 year old orphan who lives with her grandfather. For christmas, her grandfather decides to take her as well as his other daughter's family on an 8 day cruise to Mexico. Her aunt, along with her two daughters, are typical bullies masked in designer clothes, calorie counting, and makeup. In other words, the cruise is an 8 day vacation in hell. To Holly's delight, and Dominic's misfortune, they get photographed together while she was leaving his room after getting using his bathroom to rid herself of her seasickness. This is when the story really moves. Dominic is a member of the band ReadySet. If you've read Awkward by Marni Bates then you'll remember him from there. The tabloids accuse him of hitting this mystery woman (Holly), and in order to kill the rumors he strikes a deal with her to be his fake-girlfriend. From here on out, we all know the direction the novel will take, even the misunderstandings that occur on whether the behavior of the other person is for the cameras or there is some hint of real feelings behind it. Since this novel is told from both Holly and Dominic's POVs you get to see how each one of them really feels and you just want to smack them and tell them to just get on with it and get together already. While the back and forth banter between Dominic and Holly was very cute and resulted in a ton of funny situations, I just hoped we spent more time with them really talking or just any awkward situations to occur because staying in the same suite as your fake-boyfriend or fake-girlfriend HAS to cause some red-face inducing situations right? I also really wanted to know how Dominic did with his new venture of lyric writing. He's also known as the Drummer of ReadySet but he took this vacation to write and relax. I've read the beginning of one of his lyrics and it sounded fun! I hoped that Bates gave us a bit more on what happened with the song he composed and how it was received by his bandmates and management. The ending of Decked With Holly is predictable, but that's something to expect from a contemporary romance genre. While throughout reading the novel I found myself skipping a few descriptive paragraphs here and there and wanting to read more dialogue between the characters, I really did enjoy it. Decked With Holly, in my opinion, wasn't as enjoyable as Awkward, however it was an overall great novel that I am sure fans of Marni Bates and cute contemporary novels in general wouldn't want to miss out on! I think I liked this one more than Awkward simply because it employs one of my favorite classic plot lines - the fauxmance. I was so wrapped up in their banter and awkwardness and hilarity that I forgot to think about those other things - like Nick's lyrics - introduced in the book. Whoops. Unfortunately, I have a one-track mind.